Have you ever walked down into your basement and been hit with a musky smell? Air quality in your basement can be a difficult situation when you don’t manage it. The smell can start because of a multitude of reasons. Maybe there’s sports equipment that brings back a smell that made you relive the old glory days. Maybe there are cracks in the wall and the built up moisture starts to mold. Are you not sure what to do about the smell? We have you covered with a few eco-friendly tips to change the smell of your basement. You need to sniff out the source of the smell in your basement. A few places to look would be any direct opening to the outside, like windows or doors. Sometimes, condensation can form and the build-up can really hurt you if it does not dry up. You should examine your pipes and walls for the same reasons, any additional moisture can be harmful to your basement. If these locations are not the source, then it might be a piece of old furniture, carpet, or storage you keep tucked away, so once you locate the origins, make sure to get rid of it. Now that you have identified your target, you must get rid of it quick. For mold and mildew, we advise you to use vinegar. Vinegar is a normal ingredient you may use to cook with but also a swift bacteria killer and within a few minutes after a deep scrub, the mold or mildew should be gone. If you are not too fond of the smell of vinegar then lemons are for you. When life gives you lemons, make a cleaning solution by mixing water and lemon juice together. This solution can minimize the chances of mold build up and leave a pleasant citrus smell in the air. 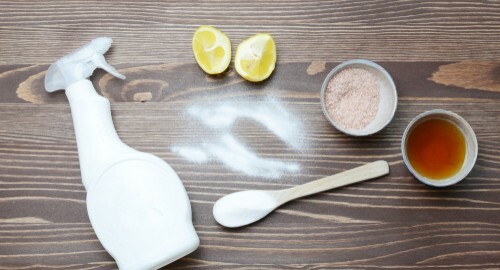 Again, if these two scents bother you, think about using baking soda. Baking soda can soak up moisture as well as deodorize the basement smell. To do this, cover the troubled areas with baking soda and let it settle for about 15 minutes. When the smell dies down, be sure to clean up the powdery mess, a simple click of a vacuum should work. If you do not have any of the items on hand use antibacterial soap. Mix up a quick concoction and start scrubbing down the problematic areas of your basement. In fact, this is the quickest method of cleaning up the smell. Remember, if the source of the smell comes from moisture that is seeping through your walls, it’s a bigger problem then just covering up the odor. B-Dry offers an eco-friendly solution to waterproofing your basement. B-Dry systems have been successful in over 200,000 basements worldwide. Dealers of B-Dry have the proper certifications and carry liability for your protection. B-Dry has your back and covers you inside and out.